As we start to see more properties hit the market, competitive pricing becomes even more important ensuring sellers get the best price for their home in the quickest timeframe possible. Many homeowners eagerly turn to Zillow to obtain that magical number for pricing a house to sell. 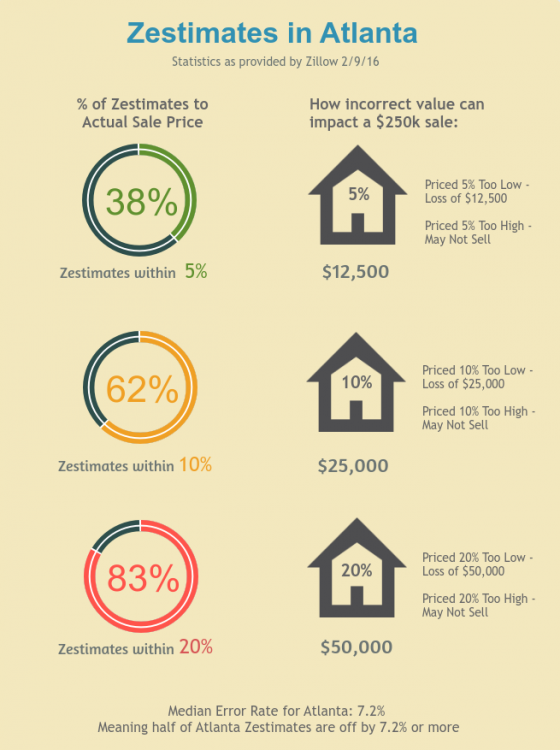 Zestimate typically offers a recommended sale price associated with a specific property, but all too often this price does not serve the seller’s best interest. Likewise for buyers, Zestimate can provide misleading pricing information for homes not properly evaluated by an appraiser or real estate professional. Zestimate is Zillow’s branded estimate of value based on publicly available data like physical characteristics, tax assessment data and previous sales of homes, including the most recent sale of the subject property. In addition to public data, Zestimate also allows for user-submitted data, taking into account special features, location and market conditions. It is not an appraisal, and in many cases generates unrealistic estimated values. In metro Atlanta, only 37.8% of Zestimates are within 5% of a property’s actual value. Some Zestimates are off by 10 or even 20%. The median error rate for metro Atlanta Zestimates is 7.2%, which means half of the Zestimates are off by 7.2% or more. To give perspective on this variance, a $250,000 house value could be off by $18,000! Priced too low, you could lose thousands of dollars; priced too high, your house may never sell. Zestimates and other online valuation tools are simply a starting point. For the best accuracy in analyzing comparable homes to determine market value, consult an appraiser or a Real Estate Specialist. These professionals, who are real people as opposed to complex algorithms, have more direct experience and keen insight on the local market to provide the most accurate assessment of your property.